Why Buy From Glacier Nursery? 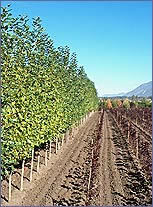 Premium grade northern grown nursery stock you can depend on and prices that will help you stay competitive. Get what you want, when you need it! 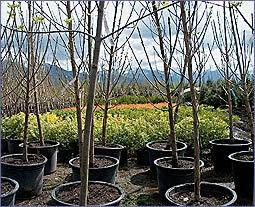 Approximately 1,000 varieties of trees, shrubs, evergreens and perennials available for immediate pickup or shipment. Spring, summer and fall. Convenient and timely deliveries to your yard or job site throughout the planting season help you stay on schedule. Approximately 2,000 B&B trees and 250,000 containers in our yard May 1, ready for immediate shipping throughout the summer, thus, saving you from having to maintain costly inventory. We ship every week the ground is not frozen. 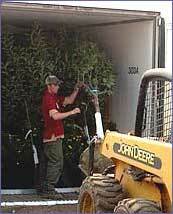 We will ship to your nursery, holding yard or job site, where ever is best for you. No minimum order! Order only what you need! Volume discount! The more you buy the more you save! We deliver weekly throughout Montana and Wyoming at reasonable rates. With convenient and timely deliveries to your yard or job site throughout the planting season, we help you stay on schedule. We ship in closed refrigerated vans so your stock arrives to you in prime condition, no matter what the weather conditions.